M/V Mermaid II is a 33 meters, double engine steel motor yacht. One of the most comfortable diver boats in Asia, she easily accommodates 18 guests in 8 deluxe cabins and 2 guests in a budget cabin below deck. All deluxe cabins are on the main deck with large panoramic sea view windows. Each deluxe cabin has a double bed and single bunk (max pax 2 per cabin), individually controlled air conditioning and en-suite bathrooms. Below deck the budget cabins have twin bunks, vanity sink, air-conditioning and share a bathroom with one other cabin via adjoining doors. There is a wide stern dive platform with two exit ladders and fresh water showers with warm water. The dive deck is huge with plenty of room to gear up, individual boxes for your dive gear, camera tables and loads of rinse tanks. The dining room is located on the main deck where delicious buffet style Thai, Indonesian and western meals are served. The saloon is large and spacious with lounge suites and big windows, bar fridge, tea and fresh roast coffee and free soft drinks and juices. Featured with Flat screen TV, DVD, music center, library and a full selection of marine life books. There are two outside decks – the shade covered party deck with its comfy cushioned lounge suite around nearly the whole deck and the sun platform in front of the wheel house gives you the choice to sunbake or not !. EANX NITROX is available on every cruise via our new rapid fill nitrox membrane system. Max. Guests – 16 main deck in 8 deluxe double or twin bed + 2 in "down below" budget twin. Rental is charged on a “per diving day” basis. Full rental equipment is available. Dive computers are mandatory – 1 per diver. Please advise your rental equipment needs including sizes when you book. Both vessels carry mostly 12 liter tanks plus some15 liter tanks available. There is no additional cost for a 15 liters tank or 15 liters nitrox fill – however it is subject to availability and the Cruise Director’s discretion as to who needs the larger tanks on each cruise. Tank valves are international and some DIN adapters are available on board. 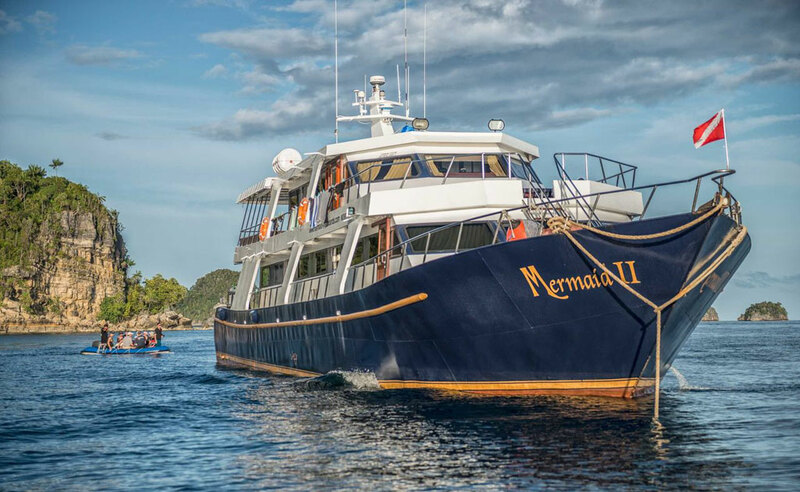 Any dive equipment failure or loss will require you to rent a replacement from Mermaid Liveaboard at our published rates. If Mermaid Liveaboard equipment is lost/damaged, full replacement cost will be charged at the discretion of the Cruise Director. Published equipment prices are available on board. Our on board Chefs is excellent, preparing a variety of Thai, Indonesian and Western dishes. Please advise any special meal requirements on the guest information form. Transfers from/to airport and all free of charge points outlined in our FAQ section, all meals & snacks, coffee, tea, hot chocolate, soft drinks and drinking water, tanks, weights, weight belts and diving with experienced Dive masters/Instructors. Transfers outside of the free of charge zones outlined in our FAQ section , national park/port fees, Fuel Surcharges if applicable, Nitrox fills , rental equipment, on board courses, massages, souvenirs and alcoholic beverages.